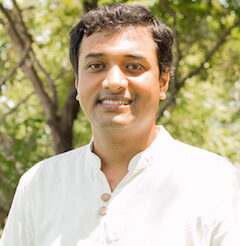 Sujay Seshadri is working as a meditation and life enhancement mentor at Kamalaya Wellness Sanctuary, Koh Samui. He is inspired by the vision of making a difference to individual's lives and hence the world at large. Having been exposed to esoteric spiritual truths and deep insights in the intricacies of the human mind, Sujay has been working with audiences across all echelons of society and all parts of the world for the last 16 years. He enabled people to discover greater levels of commitment, success, love and increased their physical and emotional wellbeing, merely by bringing about a shift in their perception. Sujay believes that life is a constant process of learning and feels motivated and blessed to share his learning and experiences with others.